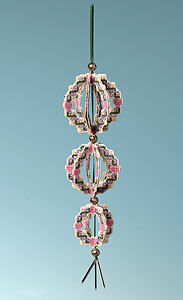 This Sparkler is decorated with a design worked in green, pink, blue and silver, and is worked on white perforated paper. The three globes are threaded with green ribbon and silver beads, and finished with silver bugle beads. Finished length is about 24cms.